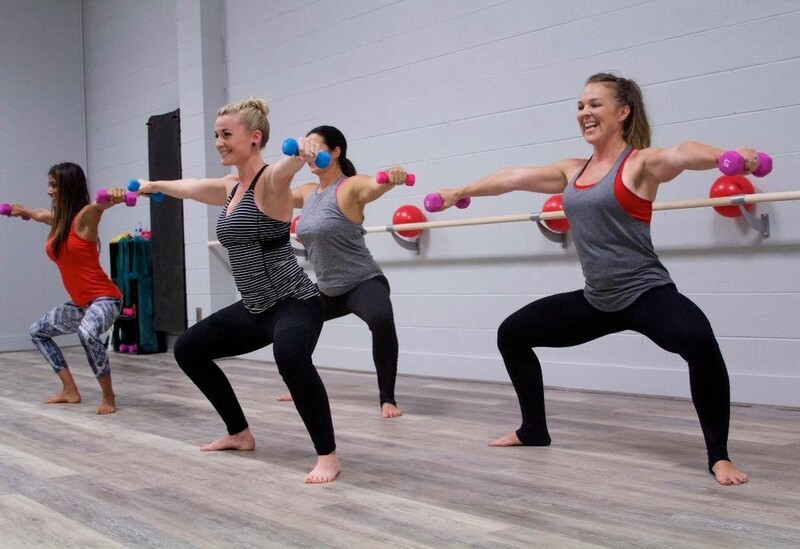 Barre is a full-body, challenging, yet non-impact fitness class designed to produce beautiful, sculpted, lean muscles. It focuses on your hips, thighs, seat, abs and arms. 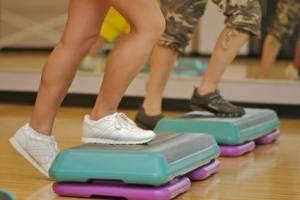 It combines Pilates, yoga and ballet moves without the impact and injuries dancers endure. 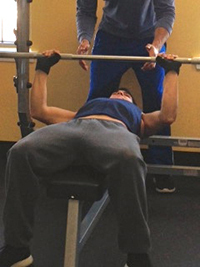 Light weights are also implemented for upper body workout. Short on time? 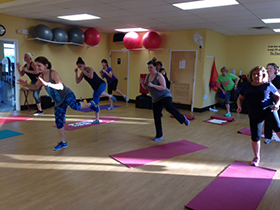 Bikes and Bands was developed exclusively for Fuel Fitness in Sicklerville. This total body workout brings the best of both worlds together in one class. Get the cardio benefits of our biking class fuzed with ‘on the bike’ strength training using our resistance bands. Tone your arms, back, abs, chest and legs while burning tons of calories! Note: Bike reservations can be made online no more than 24 hours in advance. You must arrive at least 5 minutes before class or your spot may be reassigned to someone on standby. Cancellations must be made up to 30 minutes before the start of class. Cancellations after that time frame (including "no-shows") will result in a $2 fee charged to your account. Experience a full body strength-training workout! 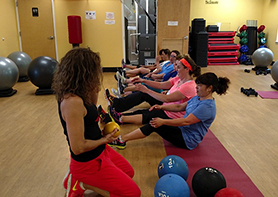 This class uses barbells, hand weights, medicine balls, bands, and more to promote muscular endurance, flexibility and body alignment. Challenges all your major muscle groups by using the best weight-room exercises like squats, presses, lifts and curls. Never the same workout twice! The more muscle you have, the more calories your body burns! Our Bootcamp program builds strength and fitness through a variety of intervals that includes weight/resistance training, calisthenics, plyometrics, and more. This class is ideal for those who want to lose body fat, increase cardiovascular efficiency, and increase strength. We may even take the class outdoors! Think of it as a mini-version of military basic training. 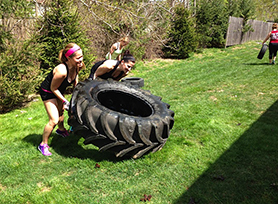 It promotes both camaraderie and team effort, and is designed to push people a little bit further than they would normally push themselves in the gym alone. Train like a pro! We’ll mix boxing combinations and athletic drills to challenge you and achieve increased cardiovascular fitness, agility and quickness. Developed for participants of all levels, you will kick, punch and sweat your way to a higher fitness level. Bring your own boxing gloves and wraps, or shadow box without hitting the bags! A 30-minute workout that targets your entire lower body! You will work your abdominals, obliques, glutes and legs using weights, bands, balls and body weight against gravity to slim and tighten those areas! A perfect blend of cardio, partnered with strength training in which you'll leave this class feeling revitalized and fit! Using a combination of balls, weights, barbells or bands, this is truly a TOTAL body workout. 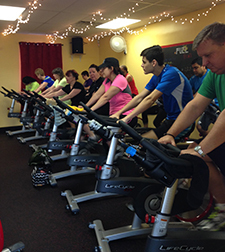 Indoor Biking is a challenging, fun and energetic music-driven stationary cycling class that utilizes various training techniques and motivational strategies to simulate actual riding experiences. You’ll jump, sprint and climb to a new level of fitness! Calorie burn is off the charts! Our classes are for all levels of fitness, though beginners are urged to arrive 15 minutes before class for an informative bike set-up practicum. Note: Bike reservations can be made online 24 hours in advance. You must arrive at least 5 minutes before class or your spot may be reassigned to someone on standby. Cancellations must be made up to 30 minutes before the start of class (or 5 minutes by calling). Cancellations after that (including "no-shows") will result in a $2 fee charged to your account. If you are running late and want to keep your bike, YOU MUST CALL US and we will gladly hold it for you! Craig "Miami" Vines has traveled across the country to study extensively with Billy Blanks, founder of TaeBo. For 25 years he has packed in the crowds in south Jersey gyms such as Bally's, YMCA and Royal Fitness. Miami now brings his knowledge and unique way of teaching to FUEL FITNESS! His contagious personality will get anyone hooked!! ALL fitness levels welcome! If your goal is to decrease body fat, build muscle and increase your cardio endurance, our Personal Training* can keep you on track, motivated, focused, and accountable! If you have specific health conditions or injuries, your trainer will work with you and your Physical Therapist or doctor to plan a safe and effective program. Piloxing uniquely blends the power, speed, and agility of boxing with sculpting, core work, and flexibility of Pilates. Added to the mix are exhilarating dance moves. You will have a muscle-toning, fat-burning workout that will make you feel physically and mentally empowered! A full-body cardio jam session that combines easy to follow moves with simulated “drumming.” The workout fuses cardio, Pilates, plyometric & isometric moves. It burns between 400 and 900+ calories per hour, and is FUN! Drum your way to a leaner, slimmer physique! This popular 30 minute Step class requires you to do choreographed exercise routines up, onto, down, and around the step for great cardio fitness. 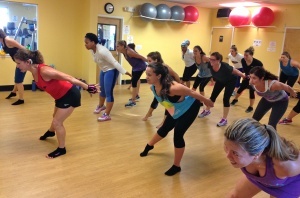 Our Step Class will help increase your cardiovascular system, strengthen muscles, & increase your metabolism! Tabatacize is a high intensity interval training group fitness class consisting of 8 rounds of 20-second intervals of maximum effort exercise separated by 10-second rest intervals. This class is extremely effective at burning calories and body fat not only during the activity, but afterwards. Due to the high intensity of the workout, a metabolic after-effect is produced, meaning, your body is burning additional calories even after the workout is over, sometimes up to 36 hours or more! Anything goes in Tina's Torture! 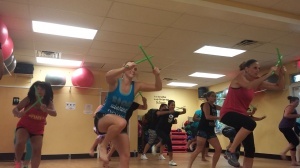 High energy, non-stop action throughout this hour-long class. You'll kick, punch, and jump your way to fitness! Like all of our classes, it can be modified for ALL FITNESS LEVELS, so don't let the description dissuade you from joining in the fun! TRX Suspension Training consists of bodyweight exercise which develops strength, balance, core stability, and flexibility simultaneously in this new workout craze. Your body will be constantly challenged to stabilize your movements against the forces of gravity. 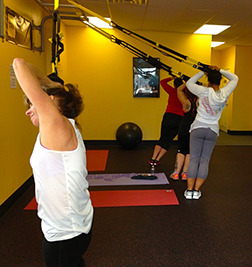 TRX training is FREE to those with a "Classes Only" or "Full Gym" memberships, as well as Fuel Passes. Yoga is the perfect way to work on your flexibility and strength. Yoga poses "work" by stretching your muscles. It can help you move better and feel less stiff or tired. At any level of yoga, you'll start to notice benefits in no time! Studies have shown that people improved their flexibility by up to 35% after only 8 weeks of yoga.